George and Brad Party Hard for a Cause! Brad Pitt and George Clooney, the mega-stars of the upcoming “Ocean’s 13,” partied until the wee hours of the night on a yacht in Cannes to raise money for Darfur refugees. The Hollywood hotties raised nearly $10 million for a cause close to both of their hearts. 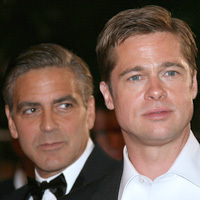 Clooney and Pitt plan to host similar events in Los Angeles, Chicago and Las Vegas. Click on an image to view the "Ocean's 13" Photocall photo gallery!